This article “Yggdrasil Jackpot Slots Won Twice In November” is brought to you by Night Rush Casino, Newest Canadian Casino, accepting C$, USD, EUR. Here you will get fast payouts, professional support 24/7 and generous bonuses. Click here to read Nightrush Casino Review. In November, the attention of big progressive jackpot hunters is drawn to Yggdrasil Jackpot Slots, which set a new record of its own. This is not a world record in online casinos, as is the case with Mega Moolah and its 18.9 million euros jackpot. Joker Millions jackpot rose from €100.000 to €7.8 million. It took nine months, but the amount is still very decent. As usual, such events do not pass unnoticed. As a result, the Joker Millions progressive jackpot was won on November 10, and the amount reached €7,832,26. This is €2.6 million more than the previous record set in July 2017. The winner was a player from Sweden. He hit the jackpot at one of Yggdrasil casinos. The decisive bet was only 50 cents. 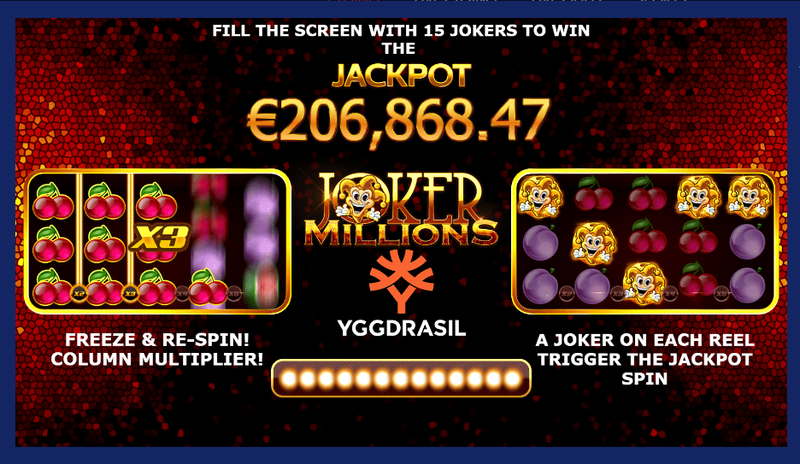 According to the game developer, since the launch, the Joker Millions slot has paid out a total of €26.9 million as progressive jackpots. This includes the €7.8 million. Night Rush Casino invites all Canadian players to play Joker Millions slot woth Canadian dollars. On November 23rd, one of the Yggdrasil jackpot slots Empire Fortune progressive jackpot slot was won when it reached €2.2 million. Another Swedish player won this huge money after a bet of just €4. A feature of progressive jackpot slots is that a certain percentage of their bets are credited to the jackpot “fund”. Each player who bets, respectively, increases the amount of possible winnings. Thus, playing jackpot slots for free is not allowed. To win big, choose the jackpot slots that Yggdrasil casinos offer. Jackpot slots is your chance to become rich in the shortest possible time. It is worth noting that Yggdrasil Jackpot Slots are available not in every Yggdrasil casino. But you can play Yggdrasil jackpot slots at Night Rush Casino. Great News For Canadian Players. Netent In Canada.